As I see it, cracks are opening in the greatest Bubble of all time. Serious fissures have developed in EM, Europe and China. Meanwhile, the stimulus-driven U.S. economic boom runs unabated. Global fragilities place downward pressure on U.S. market yields, while faltering Bubbles elsewhere stoke (self-reinforcing) outperformance - and speculative excess - within the speculative U.S. equities market. The Fed faces a difficult challenge of weighing buoyant U.S. economic data and inflating asset prices against heightened global market fragilities. April Construction Spending was up a much-stronger-than expected 1.8% (strongest since January), led by an 8.7% y-o-y increase in residential construction. This followed stronger-than-expected S&P CoreLogic house price inflation (up 6.79% y-o-y). May Conference Board Consumer Confidence gained 2.4 points to 128, just below February's 130, the strongest reading going all the way back to November 2000. The Conference Board Present Situation component jumped 4.2 points to 161.7, the high going back to March 2001. Also indicative of boom time conditions, Personal Spending jumped 0.6% in April. May auto sales almost across the board surpassed expectations, with sales estimated up 5% from a year ago. In most backdrops, such robust data would have the markets fretting both a more diligent Federal Reserve and surging market yields. Yet 10-year Treasury yields traded as low as 2.76% during Tuesday's session, before closing the week down three bps to 2.90%. Interestingly - and reflective of rapidly shifting Fed policy expectations - after beginning the week at 2.48%, two-year yields dropped to 2.29% on Tuesday before reversing course and ending the week little changed. The boom was spectacular; the subsequent bust is proving rather everlasting. Since 2012, Draghi's "whatever it takes" collapsed borrowing costs and market yields, while stoking asset inflation and economic recovery. Historic monetary inflation has not, however, changed economic structure, history or distinctive cultures. ECB policies, along with central bank reflationary policies globally, have only exacerbated wealth inequalities, economic maladjustment and financial Bubbles. This is an intractable problem for the Eurozone. There are, as well, sophisticated market operators with plans to be among the first wave out, appreciating that ECB and Italian government support will go only so far in stabilizing a hopelessly unstable arrangement. Expect more attention to ECB "Target2" balances (assets/liabilities to the euro financial system created from surpluses/deficits in trade and financial flows). Italy's accumulated Target2 liabilities ended April at as astounding $426 billion, much of it payable to Germany. This obligation will likely expand rapidly as flows exit Italian banks for refuge elsewhere. Perhaps the latest Italian Drama will spur an upswell of German support for Bundesbank President Jens Weidmann taking the helm of the ECB when Draghi's term ends in November 2019. For the almost four-year period June 2, 2014, to May 7, 2018, the Italian to German two-year sovereign yield spread averaged 49.5 bps. The high for this period was 98 bps briefly back in February 2017. The spread had averaged about 30 bps for 2018 through early-May. Well, the Italian to German two-year yield spread blew out to 353 bps in chaotic Tuesday trading. After trading last week as high as 58 bps, ten-year German yields sank Tuesday to as low as 18 bps. At Tuesday's highs, Italian 10-year yields were 288 bps higher than bund yields, widening 113 bps in a week. Leveraged speculation run amuck. It was another week of important corroboration of the Global Bubble Thesis. Market historians might look back at Tuesday's Italian debt "flash crash" and sovereign bond dislocation as another warning of impending illiquidity and general market mayhem. How much leverage and systemic risk are embedded in perceived low-risk derivative trading strategies? And it's not unusual for U.S. equities to go on their merry way right into trouble. The S&P500 rallied to record highs after the subprime eruption in 2007. U.S. stocks advanced strongly right into July 1998 - only weeks from near Financial Armageddon. Q1 2000. 1987. 1929. Early one recent sunny Friday morning, as many Swiss planned weekend hikes in the mountains, seven activists sprayed a slogan on hoardings near the Bern head office of Switzerland’s central bank. “Please remember why we created you,” it read in big red letters. The dawn action, a rare act of rebelliousness in the famously conservative Alpine state, coincided with the Swiss National Bank’s annual shareholders’ meeting. It was the latest protest by a group of Swiss economists and campaigners ahead of a referendum on June 10 on radical reforms to the way a modern economy functions. The campaigners’ proposals would ban commercial banks from “creating” money through their lending to businesses and consumers. As they see it, the objective is to stop bankers from — again — putting Swiss voters’ savings at risk by reckless lending that could blow up the financial system. Instead, they propose that the SNB should re-assume what they argue is its constitutional role — as defined in an 1891 referendum — as the monopoly provider of Swiss francs. “The will of the people has been forgotten,” reads their campaign literature. The campaign is resonating internationally because it has pitted the anti-establishment anger generated by the 2007-8 financial crisis against defenders of the global financial system — led in Switzerland’s case by the SNB. The proposals have tapped into a wide array of political currents, from the libertarian right, which has long debated the issue of how money is created, to leftist critics of the power of private banks. “Vollgeld [or “sovereign money” initiative] fits with a long-running debate among economists that re-erupted after the financial crisis — not just in Switzerland and Germany but countries from the US to the UK and Iceland,” says Nadia Gharbi, an economist at Pictet in Geneva. Thomas Jordan, the SNB’s chairman, warns the Vollgeld would be a “dangerous experiment” that would destroy a functioning banking model and could also damage the economy. The Swiss campaign has taken on even greater relevance because it coincides with the rise of cryptocurrencies — digital forms of payment, such as bitcoin, which use blockchain technologies — whose supporters have often echoed many of the same themes. Like notes and coins, cryptocurrencies could be backed by the central bank and supporters say their virtual format would allow them to circulate much more widely and to potentially replace ordinary bank accounts. As a result of the bitcoin mania, central bankers worldwide have started to debate whether they should one day issue e-versions of national currencies — even if the SNB is among the most vocal warning of possible dangers. Switzerland has an outsized financial sector — despite its small size, it is the world’s biggest centre for managing cross border wealth. But it has become a test ground for such a radical proposal because, under its system of direct democracy, just 100,000 signatures are required to force a referendum. Vollgeld’s basic idea is to abolish “fractional reserve banking” — the basis for financial systems around the world. Under fractional reserve banking only a portion of deposits held by banks on behalf of customers are backed by “central bank money”, comprising of notes and coins, or the deposits that banks hold at the central bank. The result is that when banks issue new loans to businesses or individuals, they are often creating new money in the economy. Under Vollgeld, the amount of money injected into the economy would be overseen by the central bank — rather than profit-maximising banks — which, supporters say, would help prevent credit-fuelled boom and bust cycles. The SNB would also have the authority to allocate central bank money to the government — or even directly to the public — although this could fuel fears of inflationary monetary policies. Jean-Marc Decressonnière, a banker in Basel, was taken aback when he realised he was responsible for creating money. “It was a surprise — we were simply not aware.” He is one of three managing directors at the Freie Gemeinschaftsbank in Basel, a not-for-profit finance house which focuses on lending to ecological, community and educational projects and tries to demonstrate “ethical” banking can work. Instrumental in his thinking, Mr Decressonnière said, was a research paper published in 2014 by the Bank of England which pointed out that — contrary to popular understanding — most money in a modern economy was created electronically by commercial banks. In the UK, it is about 97 per cent, in Switzerland about 90 per cent, according to the Vollgeld campaign. But Mr Decressonnière is one of the few bankers in Switzerland backing the Vollgeld campaign. Nobody has worked out what the exact effect would be for Swiss banks — the referendum proposal leaves implementation details unclear. The country’s large private banks would be largely unaffected — managing the wealth of the world’s rich is their main business, not lending in Switzerland. UBS and Credit Suisse, the country’s two largest banks, have large international operations, which would also probably not feel much impact. The debate has not been easy for the SNB to navigate. Normally, it steers clear of political controversies. But on this issue Mr Jordan sees a responsibility to intervene. “On a matter which is directly linked to our mandate, it is imperative that the SNB states its views as clearly as possible,” he told a Vollgeld supporter at the central bank’s annual meeting. The SNB chairman argues that new credit from bank lending is essential for economies to function, but Vollgeld would put “grit” in the system, making it more complicated and expensive. Moreover, Vollgeld would return Switzerland to “monetary targeting” — where the central bank tries to control the supply of money flowing in an economy — a system the SNB argues was discredited and abandoned 20 years ago. Vollgeld supporters dispute this last point, saying the SNB could still use changes in interest rates to influence economic activity, rather than artificial money supply targets. However, Mr Jordan also worries Vollgeld would overburden the central bank with powers, which could lead to questions about its political legitimacy, especially if something went wrong. Injecting money into the economy for governments or citizens would be easy in the good times; but withdrawing it when the central bank deemed policy tightening was needed would be much more controversial. “Our power should be limited to what we need to fulfil our legal mandate. More is neither necessary nor sensible,” Mr Jordan told the FT.
What is more, according to Mr Jordan, Vollgeld’s proponents have failed to take account of regulatory reforms which have strengthened the banking system since 2008. What will happen on June 10? An opinion poll this month by the SRF public broadcaster showed just 35 per cent of Swiss voters in favour in Vollgeld. Some 49 per cent were in the “no” camp, and 16 per cent undecided. In the past two years, the Swiss have also rejected similarly radical plans to abolish TV licence fees and introduce a “universal basic income” for all citizens. Notably, the Vollgeld campaigners have failed to win over fellow rebels in Switzerland’s burgeoning “crypto valley”, the network of crypto and blockchain start-ups in Zug, outside Zurich. But crypto pioneers see crucial differences, including the shift to greater state economic planning that could arise from the government being more involved in lending decisions. “On one side, [the cryptocurrency pioneers] it is very libertarian in the true sense — and on the other there is old fashioned economics,” said Richard Olsen, founder and chief executive of Lykke, a Zug-based blockchain financial Exchange. Whatever happens on June 10, Vollgeld supporters say their fight will continue. “The Vollgeld has led to a lot of critical thinking and reflection about the current system — and whether it’s still appropriate. It’s not immune against all criticism,” said Mr Decressonnière in Basel. Bern protester Mr Wüthrich says the Swiss are, historically, slow adaptors. Pension reforms and votes for women took several referendums before they were accepted. The referendum would not end the debate, he says, because “the idea that only the central bank should manufacture money is too reasonable and sensible”. The Vollgeld proposals may be a response to the 2007-8 financial crisis but they are similar to ideas which emerged in the US in the 1930s, in the wake of the Great Depression. In 1935, the economist Irving Fisher proposed a “100 per cent reserve banking” system to eliminate bank runs, smooth economic cycles and reduce indebtedness. Fisher’s ideas were never implemented, but became fashionable again after 2007. Support has come from surprising quarters. In 2012, a “working paper” published by the International Monetary Fund found empirical support for Fisher’s claims. What was more, they would also boost economies while keeping inflation low, the report’s authors argued. “That paper challenged the easy prejudice that said we could not have a better financial system,” said the economics professor Hans Gersbach. Others proposing reforms to fractional reserve banking include Mervyn King, the former Bank of England governor, who has suggested an insurance scheme for banks. In exchange for a “premium”, the central bank would provide cash to banks if they faced liquidity problems. But he believes it would be going too far to abolish fractional banking altogether because it allows necessary risk-taking in an economy — even if the process is not fully understood. SHANGHAI – US President Donald Trump’s announced plans to target China with trade tariffs represent a significant departure from his predecessors’ approach. China is now seen primarily as an economic adversary, rather than an economic partner. That may be a difference of degree rather than kind: Trump’s policies are the culmination of a decade of US trade frustration. The sources of US frustration are well known. Since joining the World Trade Organization in 2001, China has been accused of failing to meet its market-access obligations, and even of having regressed in some areas. Moreover, China is believed to have long used state intervention, including industrial policy, to limit US businesses and investment in the domestic market, while enabling Chinese enterprises to achieve rapid technological progress. More fundamentally, however, the US is concerned that China’s rapid economic development now poses a real challenge to America’s global influence. This has fueled a sense that China must be “contained.” In Trump’s view, part of the solution is trade protectionism. In the 1980s, protectionist US policies successfully contained the growth of Japan, which, like China today, maintained a large trade surplus with the US. But those policies’ success was rooted partly in Japan’s problematic policy choices, including slow fiscal and monetary responses. In order to reduce the bilateral trade surplus, Japan introduced so-called voluntary export restraints, which hollowed out its real economy, while providing excessive protection to its non-tradable sectors. The result was a decades-long recession. But trade patterns have changed so much since the 1980s, particularly owing to the emergence of regional and global supply chains, that the very notion of a bilateral trade imbalance – one of the main sticking points for Trump – seems outdated. After all, the added value China actually derives from its exports is not nearly as large as its trade surplus. In fact, over the last decade, China’s global current-account surplus has shrunk at an unprecedented rate, falling from 10% of GDP in 2007 to a mere 1.4% today. Meanwhile, there has been little change in the US trade imbalance, indicating that America’s massive deficit is not China’s fault at all. In fact, the blame lies squarely with US macroeconomic realities, namely a low rate of domestic saving and a high rate of federal borrowing, which Trump’s tax cuts will cause to increase further. China recognizes the absurdity of the Trump administration’s obsession with forcing it to reduce the bilateral trade surplus. But it also knows that a trade war would not be good for anyone. To ease trade frictions, unlike Japan’s voluntary export restraints, China’s leaders have promised to increase imports and open up the domestic market, with President Xi Jinping predicting $8 trillion worth of merchandise imports within the next five years. China imported $2 trillion worth of goods in 2017, of which consumer goods accounted for only 8.8%. Expanding the share of consumer goods might significantly improve the welfare of Chinese citizens, who, because of existing tariffs and non-tariff barriers, now often travel abroad to make purchases. In fact, international purchases by Chinese are now equivalent to the value of all of the consumer goods China currently imports, even without taking into account fast-rising online overseas purchases. Shifting those purchases to China would help propel the shift toward a more consumption-driven economy, particularly as the middle class – and its purchasing power – grows. The impact would be even greater if US and European countries responded to Chinese calls to export high-tech products more freely. Similarly, greater openness to investment is crucial for China as it seeks to ensure continued technological progress. As it stands, even if China’s economy is the same size as America’s, China will maintain a competitive advantage in manufacturing, because its per capita GDP is only one-quarter that of the US. Yet China remains in a low position on global value chains, despite recent improvements. And, so far, its technological advancement has depended largely on greater openness to direct investment, which has supported progress in research, development, and application of advanced technologies. If China is to continue upgrading its economy, this process must continue, supported by initiatives to promote entrepreneurship and protect intellectual property rights. Fortunately, China knows this well. 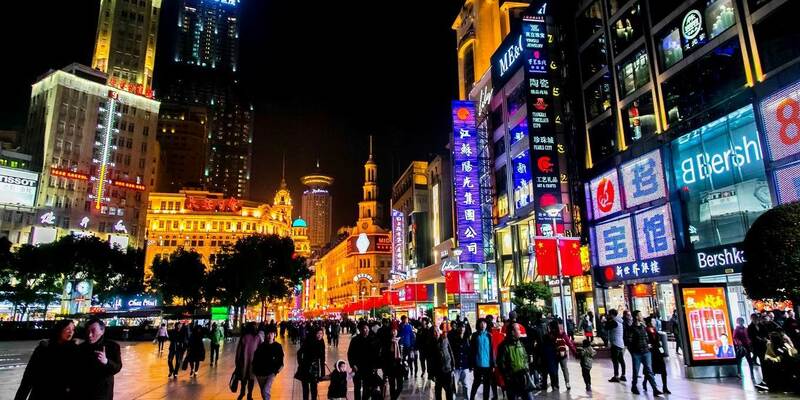 The authorities are hoping for foreign direct investment of $600 billion in the coming five years, and expect Chinese outward direct investment to reach $750 billion five years later. To be sure, more must be done, and China needs to go further to clear institutional barriers to manufacturing and financial reforms. But China has already shown itself to be handling US trade pressure in a more savvy way than Japan did in the 1980s. Indeed, far from laying the groundwork for a protracted recession, China’s response – increasing imports and accelerating domestic structural reforms – will support high-quality long-term growth. Members of the European Union need to send a clear message to the new Italian government: We will not allow you to destroy the eurozone. They view themselves as the executors of the true will of the people. They put their nation first, without any regard for international treaties. But, no, it's not Donald Trump and his supporters in the United States we're talking about here. It's Italy's new government, which is currently being formed and whose political intent could best be summarized as such: Italy first, reflection second. For the European Union, though, the Italian version of Trumpism is no less dangerous than the original. The political platforms of the new populist coalition government in Rome are comprised primarily of huge tax cuts while at the same time increasing pensions and social welfare services -- which would push an already highly indebted nation even further into debt. It's an agenda that brings along with it the constant threat of suicide attack on Europe: Either you make concessions, or we'll blow up our country and the eurozone along with it. At first hearing, the threat sounds like the one issued by former Greek Finance Minister Yanis Varoufakis, who three years ago threatened that the common currency would crash if the other eurozone countries didn't forgive a significant chunk of Greek debt. In truth, however, the attack from Rome is much more brash and perilous. It's more dangerous because, in contrast to much smaller Greece, the eurozone bailout fund would only be sufficient in a worst-case scenario to provide aid to Italy for one to two years. After that, it is almost inevitable that that euro would be thrown into an existential crisis that could drag banks and financial institutions around the world right down into the abyss with it. If Greece represented a bomb for the eurozone, then Italy is a nuclear bomb. Beyond that, the offensive from Rome has been characterized by a unique form of audacity. Greece was a poor country on the verge of bankruptcy that asked for assistance at a point when it was in dire straits. The Italians, on the other hand, are wealthier on average than the Germans and many times richer than the people of Latvia or Slovakia. And yet people in those countries would ultimately be held liable for the consequences of a tax reform that primarily benefits the wealthier portion of the Italian population. If the new government is able to prevail with these reforms, it would establish an extremely perfidious transfer union in Europe: one that moves money from the poor to the rich. Eurozone governments would thus be well-advised to cooly reject unreasonable demands coming from Rome. On the one hand, they cannot allow any doubts to arise as to whether the cabinet of prime minister-designate Giuseppe Conte is required to adhere to the applicable budget rules. And on the other, those in power in Berlin, Brussels and Paris, contrary to the advice currently being given by some German economists, should absolutely continue to push forward with their plans for reforming the eurozone. And this should be done in the spirit of the proposals put forward by French President Emmanuel Macron months ago -- proposals which would also benefit Italy. A larger investment budget, for example, could help reduce high youth unemployment in southern Italy. At the very least, it would be more likely to create new jobs than would lowering the retirement age, as the new government in Rome plans to do. Italy also deserves better support in tackling the refugee crisis after years of being left in the lurch by the rest of the EU. It's a proven principle: The prospect of getting more money from Brussels has moved many governments to rethink their policy plans in the past. The EU's most important ally here is the financial markets. For several days, risk premiums on Italian sovereign bonds have been rising, and this trend will continue if the new government sticks to promises of prohibitively expensive tax cuts and social welfare benefits. If, on the other hand, it quickly adapts to reality, then those premiums will drop, and the government will have to set aside less money for servicing its debts. It may sound like a paradox, but it is in fact true that the better a country manages its budget, the more it is ultimately able to spend. The question is how long it will take for the populists in Roma to accept that logic. The slogan for Macron's reform of the eurozone is greater solidarity in exchange for greater stability -- and the same should apply for how we deal with Italy's new populist government. In the end, a deal could arise that would serve the interests of both sides. And it's high time for Donald Trump's Italian impersonators to learn something about the art of the deal. “Liquidity is the new leverage”: That was the ominous warning fired by Goldman Sachs’ head of Global Credit Strategy, Charles Himmelberg, admonishing traders about the dangers of the ongoing algorithmic transformation in the markets, including the toxic combination of Quant Funds and High-Frequency Trading and how they put the bond and equities markets at high risk of a systemic event. What he meant was this: The heavy use of leverage has historically been responsible for most market crashes, but right now it's liquidity—or, more specifically, the lack of it--that's likely to be their undoing. 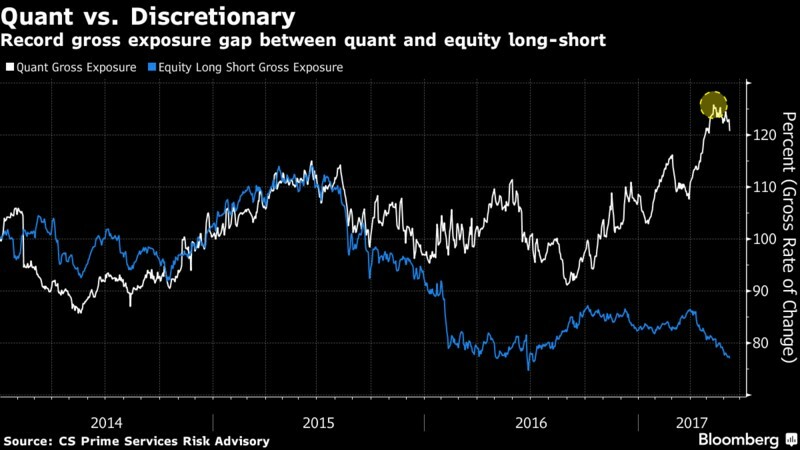 HFT traders and quant funds are likely to withdraw liquidity from the market during periods of market stress when, ironically, it's needed the most. As machines continue taking over trading roles in the market, the inability of human market liquidity providers to process complex information as quickly as their computer counterparts might lead to large drops in liquidity that could precipitate a market crash. This was not the first time that the Wall Street analyst has chimed in heavily on the subject. In fact, he’s done so repeatedly since the February 5 market crash. And just as well, because robots have truly taken over equities trading. JPMorgan estimates that passive and quantitative trading now account for 60 percent of all equities trading, double from a decade ago. Meanwhile, human discretionary investing accounts for a mere 10 percent of trading volume. Quantitative trading is a complex type of trade encompassing high-frequency trading, algorithmic trading and statistical arbitrage using a combination of sophisticated statistical models, fiendish mathematical models and computer modeling to automate the process of monitoring markets and making trades entirely using robots. This is not mere babbling by an armchair analyst but serious stuff by a non-tinfoil hat-wearing Goldmanite. There's ample evidence that HFT and QT are to blame for some of the most memorable flash crashes. The most recent flash crash of February 5 was pinned on robots and the role of high-risk volatility instruments which Credit Suisse, the issuer, thankfully banned. Others include the Peet's Coffee and Tea incident of 2012, the Knight Capital sell-off and the 2010 flash crash. Goldman offers compelling validation. The image below shows how HFTs behave around major world news events. 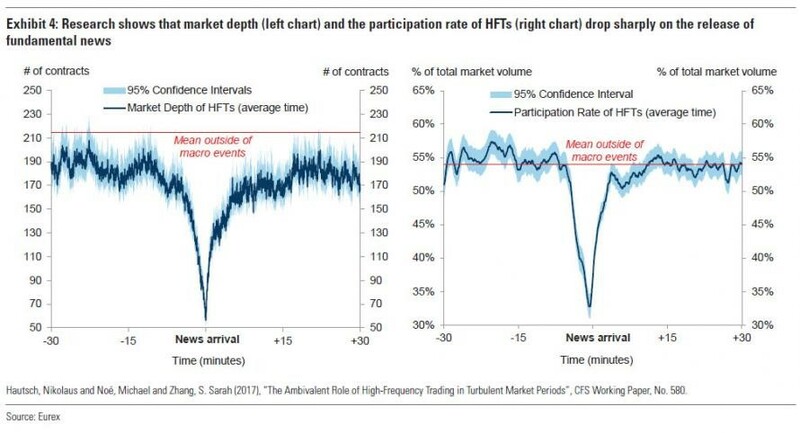 The right chart shows how HFTs' participation rate drops from 50 percent about 10 minutes before the announcement to 33 percent at the time of release. The chart on the left shows how overall market depth declines sharply around the time of news release. This HFT reluctance to provide market liquidity is what Goldman is talking about. HFTs tend to pull back whenever they realize that fundamental information entering the market is likely to give human traders an advantage. • Avoid being lulled into a sense of complacency even during times of macroeconomic stability. • Carefully consider the quality of trading liquidity even for the most-heavily traded markets. Consider 'vol of vol' when hedging market risk and don't be fooled by fat tails. And that puts paid the common belief that there's copious liquidity parked across all asset clases.